We may have millions of nodes in our graph. What if we want to look at a specific node? The first possibility is to use the Quick Search bar from the Dashboard. 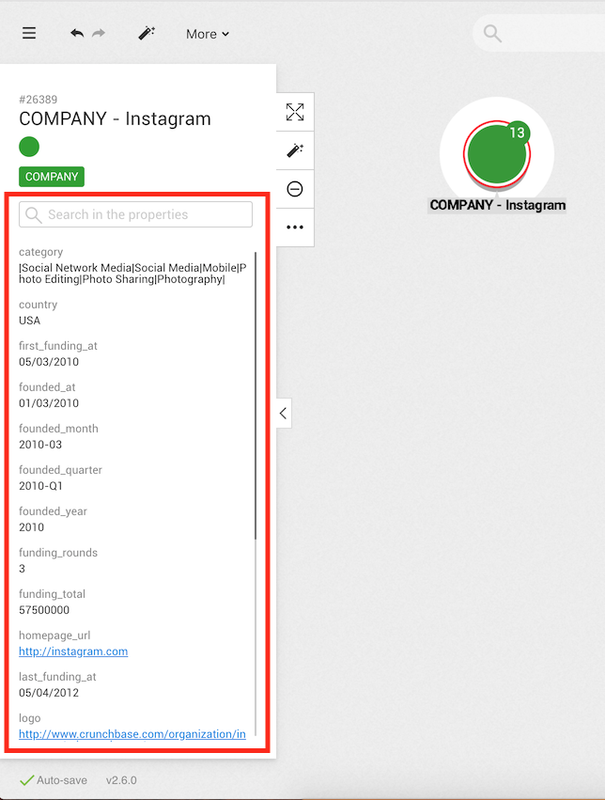 The second possibility is to use the search bar in the Workspace once we have created a new visualization. We can look for a node by typing the name of any of its properties. Here, for example, we look for the property Instagram. We see the list of suggestions that match our search. All the entries in the database containing the word Instagram will appear. These results are sorted by relevance. When we click on the result of our choice, it will be added to the workspace. Now we can visualize it. How it works : by default, Linkurious Enterprise indexes all the properties of your graph. If any property of a node matches your search, it will be returned. For example, you could find the Instagram node by typing instagram, or USA or 2010-03. The search bar in the Workspace provides an Advanced Search option not available through the Quick Search Bar of the Visualizations Dashboard. We can thus reduce the results to the category we are interested in. Those options are described in the Advanced search section.